The first Iphone 6s will not officially be sold until Sept.25, but Karalux have taken a sample to study materials as well as gold-plating method for this shell/ 24K gold housing. Although there is not difference between the appearance of iPhone 6s and iPhone 6, the material of iPhone 6s shell is changed. Regarding material: After gold-plating iPhone 6s shell ( 24K gold housing ), Karalux engineers said that iPhone 6s shell has a change in material – aluminum A7000 so it is stronger. It must be noted that iPhone 6 shell is made of aluminum A6000. The material of iPhone 6s and 6s plus is changed into aluminum, so that Karalux engineers must also change the gold-plating processes to keep the gilded surface better and more beautiful. As the picture, Apple remain the outside design of the new iPhone generation this year, like the iPhone 6 and 6 Plus of last year. The size of camera, micro and flash is kept unchanged. Even the plastic strip of the antenna at the back is also not narrowed or disappeared. The nuts at ring/silent switch position are much changed. That the nuts’ positions are changed means iPhone 6s main has different design from iPhone 6. The inside design of new iPhone 6s shell is some different detail from the same-sized iPhone 6 one, suggesting that Apple will improve the circuit board to upgrade the configuration, the battery, or apply some new technology. 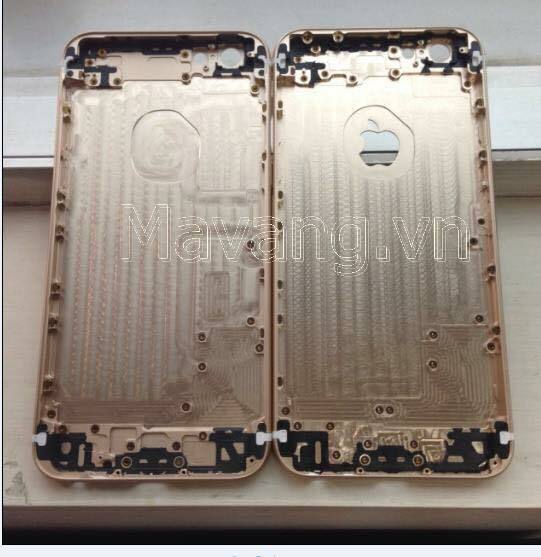 The 24K gold-plating process of iPhone 6s and iPhone 6s plus costs VND 9 million and VND 12 million, respectively. The cost is same as that of iPhone 6 and 6 plus. Especially, beside 24K gold-plated shell, customers can also choose the rose gold-plated one.